What do you recommend for treating natural cracks and fissures in stone? This stone is called Golden Silver granite and has rust, greys, and ivory colors. I understand that these are just part of stone, but I would like to keep them from being a place for bacteria to hide. Can fissures be filled with liquid material and leveled with something like a squeegee? First, cracks and fissures are not the same thing.... just to clarify. A fissure is a naturally occurring characteristic of stone, which can be weak points and can crack open, but usually do not. The stone is still contiguous along a fissure. In other words, there is no separation within a fissure. You may be able to feel the fissure and you can see them, but if the surface is finished correctly there should not be any gap or depression or canal of any significant depth. Maybe a minute depression sometimes, but just barely perceptible to the touch. So, fissures will not of themselves impair or affect the performance or integrity of the stone and are not a worry regarding granite countertop hygiene. Fissures are not a problem... unless they crack. A crack represents a physical separation of the stone. It may be a hairline crack that may or may not be full thickness or it could visibly separate. Hairline cracks do not tend to be a problem and do not get worse unless you have foundation movement and/or they have or form a "lip" at some point. You will be able to feel a hairline crack, but it may still be level. When it forms a lip is when it starts to collect dirt, etc. Bacteria is simply not an issue with granite countertops. to bacterial growth of all possible surfaces. Of course, no matter how much cleaning and disinfecting you do, you cannot remove or kill all bacteria, but granite countertops do not "harbor" bacteria at all, and the nature of the surface makes it very difficult for dangerous bacterial growth. However, if the fissures do crack, then yes... the cracks would naturally change the equation and would be more prone to bacterial growth. It is common and perfectly acceptable to apply a resin to stone to fill voids and fissures prior to polishing and shipping from the "factory" and this may have been done to your stone. You may be able to do this again, but the resin must be able to absorb into the stone, so no sealer should be applied prior. Also, there are permanent surface coatings that do form a film which can be applied, although in "normal" circumstances this would not be recommended since you now have an acrylic or epoxy countertop instead of a granite countertop. These type of coatings can look plastic, can be more of a hassle to maintain and can cause problems when/if the stone ever needs repair, etc. They are getting better, but the common wisdom is to do as little to stone as possible. The more variables you add to the equation, the more complicated the cleaning, maintenance and performance become. Filling fissure gaps with the the Pit & Chip Repair acrylic may be a viable option for small areas. If you do indeed have long fissure that seems to need filling, then you'd have to buy a lot of this product. It's made primarily for filling and repairing small blemishes like pits. So, you need to determine if you just have fissures or indeed cracks. Fissures are no worry and nothing, but sealing with one of these recommended sealers is needed. 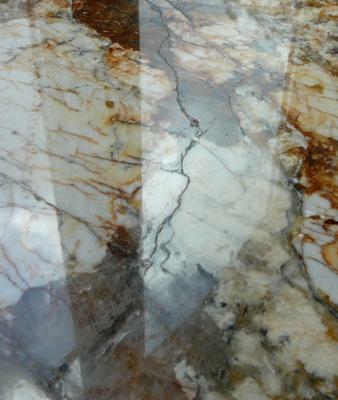 If cracked, then click here for granite crack repair options. Hi, We had granite countertops installed a couple weeks back. The surface looks spotty, with areas of high shine and low shine. It feels gritty and you can see fissures and pits. Please explain if this is normal and if we can have it treated with something that will even out the shine and fill the pits. Thank you in advance! Granite countertop slabs with a poor finish like this do exist, but no it is not "normal" for them to actually be installed. Unfortunately, it sounds like you got a bad slab and likely a shady fabricator. A blotchy look to the surface may not be a problem.... could be normal, however, a countertop that feels gritty is not. I'm guessing you did not pick out the exact granite countertop slab for installation. I can't imagine any reputable stone warehouse even buying such a slab and any decent fabricator would not install such a poor slab. It is "normal" for some granite slabs to be of poor quality. Some granites are like bad pieces of wood and no matter how hard you try you just can't sand them smooth.... they just fall apart, etc. Same with bad granite... won't take a polish or polishes very poorly and can be gritty, rough or heavily pitted. Fly-by-night fabricators advertising $25 sq. ft. installed granite countertops on roadway signs often install marginal quality slabs... how else can they do it so cheap? So, if any balance is remaining, do not pay it and take the issue up with the fabricator. They really have no argument (unless you did pick out this slab) since they know what anyone wants is a smooth shiny granite countertop. Applying a resin at the factory prior to polishing is a normal and acceptable practice to fill in natural pits and fissures in the surface. It may be possible that an excellent stone restoration pro could re-finish, resin and re-polish your granite countertop to improve the situation, but it would likely be cheaper and easier just to rip it all out and start over. I would get a second opinion from a uninvolved and reputable local fabricator that can actually see the slab in person. Maybe it's not as bad as it seems to me, but typically with these type of slabs additional polishing, etc. doesn't help a lick. Sorry to give such a crummy prognosis. Hopefully you're able to work something out without to much extra expense.